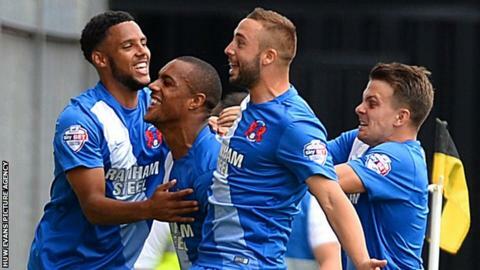 Leyton Orient's perfect start continued despite Newport clawing their way back after conceding two early goals. Paul McCallum headed the opener from Dean Cox's left-flank cross and Jay Simpson added a second with a left-foot curler with just seven minutes played. McCallum's header then hit the bar before Scott Bowden finished a fine move to pull one back near half time. Mark Byrne's dipping shot from distance a minute later brought County level but Cox struck to claim a fourth O's win. Newport substitute Josh Laurent wasted a great chance from 12 yards to grab a stoppage-time equaliser. "I felt we deserved much more from the game. We've had chances to equalise towards the end of the game. "They scored their third goal totally against the run of play - we came out in the second half and totally dominated it. "We are bitterly disappointed again that we've allowed all that good possession and good chances to slip by. But the win will come." "We set off really well and started superbly, Paul McCallum should have made it three. Had that gone in I think that would have killed the game there and then with the free header that he missed. "At half time I said it's up to you now - you can go out there and fade and die or you can stand up and try and dig out a winner." Match ends, Newport County 2, Leyton Orient 3. Second Half ends, Newport County 2, Leyton Orient 3. Ollie Palmer (Leyton Orient) is shown the yellow card. Attempt missed. Josh Laurent (Newport County) right footed shot from the centre of the box is too high. Attempt saved. Ollie Palmer (Leyton Orient) right footed shot from outside the box is saved in the centre of the goal. Attempt missed. Aaron Collins (Newport County) left footed shot from the centre of the box is close, but misses to the right. Substitution, Newport County. Tom Owen-Evans replaces Yan Klukowski. Attempt missed. Scott Barrow (Newport County) left footed shot from outside the box is close, but misses to the left. Attempt missed. Ollie Palmer (Leyton Orient) header from the centre of the box misses to the right. Corner, Leyton Orient. Conceded by Kevin Feely. Attempt blocked. Ollie Palmer (Leyton Orient) right footed shot from the right side of the box is blocked. Substitution, Newport County. Josh Laurent replaces Scott Boden. Substitution, Leyton Orient. Scott Kashket replaces Dean Cox. Corner, Newport County. Conceded by Mathieu Baudry. Attempt missed. Ollie Palmer (Leyton Orient) right footed shot from the right side of the six yard box is too high. Foul by Seth Nana Ofori-Twumasi (Newport County). Regan Poole (Newport County) wins a free kick in the attacking half. Substitution, Newport County. Aaron Collins replaces Zak Ansah. Attempt saved. Regan Poole (Newport County) header from the centre of the box is saved in the top centre of the goal. Goal! Newport County 2, Leyton Orient 3. Dean Cox (Leyton Orient) right footed shot from very close range to the bottom right corner. Assisted by Blair Turgott. Attempt missed. Medy Elito (Newport County) right footed shot from outside the box misses to the right. Corner, Newport County. Conceded by Connor Essam. Substitution, Leyton Orient. Ollie Palmer replaces Jay Simpson.